From the team that brought you Singin I’m No A Billy I’m A Tim. 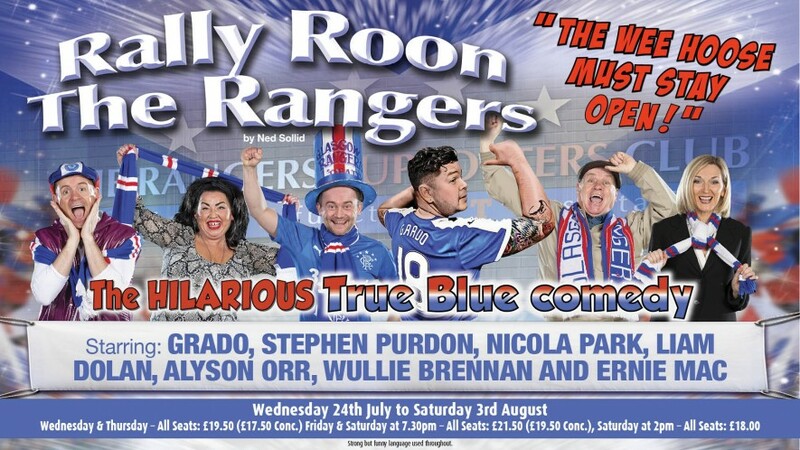 Eight die-hard true blues gather for a night of booze, banter and Rangers songs. But they are plunged into a desperate bid to save The Wee Rangers Supporters Club from demolition by the council. When all seems lost, an Ibrox disaster survivor arrives and points out the traitor in the group. Can they save The Wee Beating heart of Rangers? Come along and sing the songs, join in the banter, share the tears and teddy bears. If you’re Rangers this is for you. Strong but funny language used throughout. Starring: Stephen Purdon, Grado, Nicola Park, James McAnerney, Liam Dolan, Alyson Orr & Wullie Brennan. There is no age restriction on this production, however we do have to advise you that swearing is used throughout.